The birth of the independent television network in 1955 changed the face of British broadcasting like no other television event, before or since. Not only did it unleash a model of commercial TV broadcasting that still exists today, it also spawned a raft of small, independent production companies that helped feed the voracious appetite of the new broadcaster. One such company was AP Films which was formed in 1956 by Gerry Anderson, Arthur Provis, Sylvia (Thamm/Anderson), Reg Hill and John Read. The fledgling outfit set up offices in Islet Park in Maidenhead, overlooking the Thames, but the expected offers of work failed materialised. Bankruptcy loomed. Eleventh hour salvation arrived in the form of an offer from Roberta Lee. The writer was looking for a production company to film 52 fifteen-minute scripts about a toy character she had created called Twizzle. 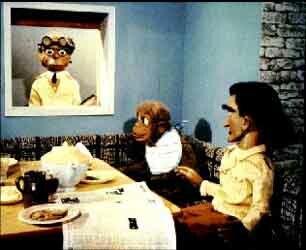 There was, however, one drawback - Twizzle [1956 - 52 episodes] was to be a puppet show. This was not exactly what the staff at AP Films had in mind when they set up the company but despite their reluctance there were mounting bills to pay. So, with was no other source of income in sight, the deal was signed. And to everyone's surprise the show was a success. This led to a further puppet production with Lee, Torchy the Battery Boy (1957 - 52 episode)] which also captured a healthy audience. AP Films went on to develop its own show with the Western adventure Four Feather Falls [1958 - 39 episodes] but it would be the company's fourth production, Supercar, that would ensure its future. Despite the success of the puppet shows Gerry Anderson didn't feel that his fledgling production company was fulfilling its true potential: "The fact we were filming with these awful creatures made me desperate. I wanted to make big pictures like Ben Hur." 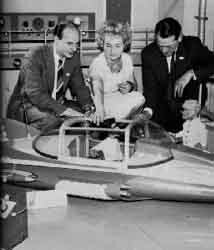 Generally regarded as the first classic AP films puppet series, Supercar [1959 - 39 episodes] almost never made it beyond its maiden flight. 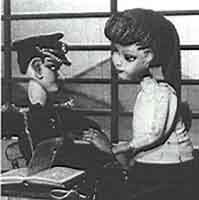 Making the show's pilot episode drained the tiny company's limited financial reserves but because of the proposed budget, Granada, the company's previous backer, declined Supercar on the grounds that it was too expensive a production for its proposed audience. Just as it looked like everything was lost Lew Grade, the head of ATV, stepped forward and offered to bankroll the series - things would never look the same again for the small production company. Soon AP Films was moving into new premises but more importantly, Supercar made it onto the American TV network, NBC. The show was a simple adventure series about pilot Mike Mercury and his amazing flying car, the eponymous Supercar, which also doubled as a submarine and spaceship. His heroic efforts were ably supported by Professor Popkiss and Doctor Beaker, and the ten-year-old Jimmy Gibson and his pet monkey Mitch. It was surprisingly sophisticated fare by the standards of its day and effectively created the blueprint for the puppet shows that were to follow, especially the decision to focus the action around a flying craft. 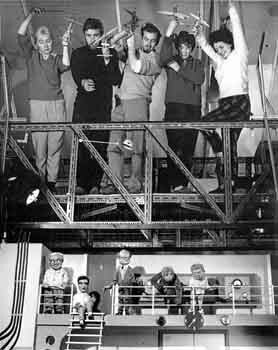 The serendipitous idea was originally conceived as a way of moving the puppets around without the need for them to walk but it soon became clear that Supercar was as much the star of the show as Mike Mercury. "I was stuck with puppets that couldn't even walk, let alone run, and I was faced with having to find a way of achieving even faster movement," said Gerry Anderson. That solution was a flying car. The show was a massive hit but this success also created problems. Whatever followed Supercar would have to better. Fortunately, Fireball XL5 superseded its super predecessor both technically and in terms of popularity.